Whenever I go camping, I like to make a batch of beef jerky. As a versatile, shelf-stable protein, jerky is invaluable (and really tasty) when you're away from it all. 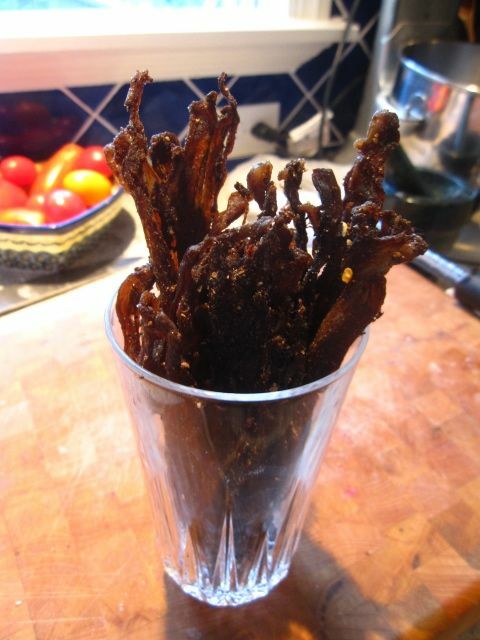 But most people wouldn't even think to try making beef jerky at home because it requires an expensive and space-hogging dehydrator, right? Wrong, as Alton Brown's beef jerky recipe proves. 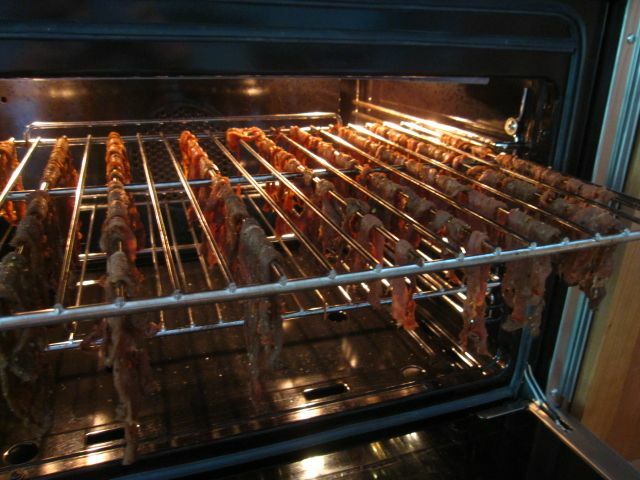 Dehydrators dry by cooking, which produces dry, cooked slices of steak, not true beef jerky. Alton's method uses a box fan, several air filters, and some bungee cords. 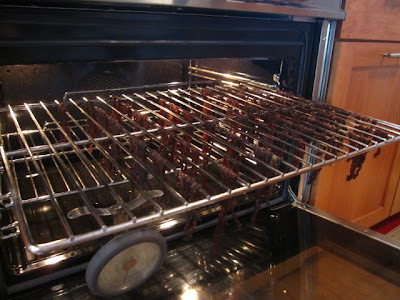 This is effective (albeit kludgy) but a bit cumbersome to set up and for me increased my inhibition to make jerky (I need to go buy filters, set this big thing up, and then I have filters to throw away later). I also had an issue with the filter fibers sticking to the final product. So instead, I lay the individual slices of meat on the bars of my oven rack and turn on the convection fan with the heat off (if you don't have a convection oven, just point a regular fan in the direction of the meat). Equally effective, and no need to buy air filters. Flank steak really is the best meat for jerky because it's lean and well-grained. Slice with the grain so the final product is a long strand of fibers which I like to eat as if it's string cheese. When you slice the meat, slice as thin as possible, but if you get some thick pieces, smash them with a meat pounder (or something else flat and heavy). I also like to cut out the larger fatty veins that run through flank steak, since fat doesn't really dehydrate well. At the campsite, a batch of jerky tomato sauce is really tasty and just one of the many uses for beef jerky.